One of the four University of Maiduguri (UNIMAID) lecturers, Dr. Yusuf Solomon Nehemiah abducted by suspected Boko Haram terrorists at Borno Yesu, along Gubio, Magumeri road in northern Borno has written his wife, directing her to name his new born male child after his father, Nehemiah. In the letter delivered to his wife, Mrs. Hanatu Solomon and obtained by Sahara Reporters, Dr. Yusuf said their abduction on 25th of July, 2017 till date, there was no sign of seriousness on the part of government, who sent them on the assignment towards fulfilling the demands of their captors. “The government should please continue negotiating with the present contact given to them by the University of Maiduguri as a means of contacting soldiers of Khalifa under the leadership of Abu Musab Albarnawi. “We plead with the government to treat our freedom with all sense of urgency and sympathy so that that we can be reunited with our families. The use of force is a serious threat to our lives,” He wrote. He recalled that the Vice President, Professor Yemi Osinbajo, while functioning as Acting President, made a promise during the commissioning of a rice mill in Kebbi State that the government would do everything to secure their freedom within the shortest possible time. Dr. Solomon, thanked the local and international media for focusing on his abduction and that of his colleagues. He also told his wife that he and his colleagues, Mr. Yusuf Ibrahim and Haruna Dashe were alive, well and hoping to return home as soon as the government met the demands of the sect. He also told his wife to extend greetings from Mr. Yusuf Ibrahim and Haruna Dashe to their wives and children. 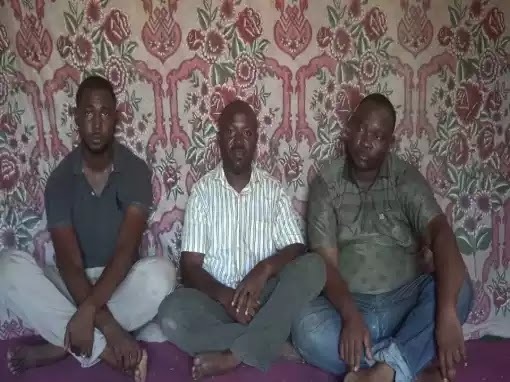 While calling on the families of the abductees’ to put pressure on the authorities of University of Maiduguri and the Federal Government for their release, Dr. Solomon, complained on the roles of the coordinators of the exploration project, Professors Saidu Baba and Professor Adamu Dzibama. He thanked the national and University of Maiduguri chapters of the Academic Staff Union of Universities (ASUU) for calling for their release, especially for including their matter as one of the reasons for the ongoing national strike by members of the union.